Hardwood deck construction in Kent. An elevated deck constructed from yellow balau hard wood timber with balustrade to match. 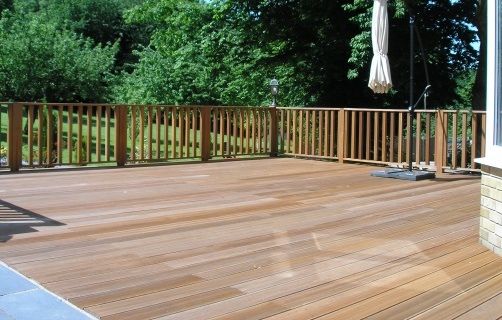 This type of decking can be left to go a naturally weathered colour or oiled annually to keep a fresh, clean look. Rob McGee & Son design, build, and maintain decks in Kent, London, The Southeast. Call 01233 740389 or email for service.